My Son and I started our Tiny Titan project last winter and completed building this June. Thank you for clear and accurate plans which made this project very enjoyable for both of us. 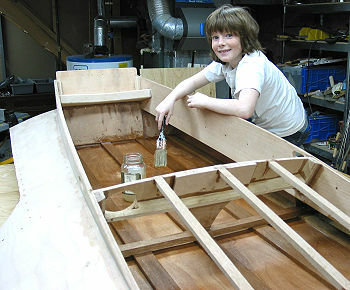 My son has called the boat "Wild Thing" and I have included pictures of our efforts. 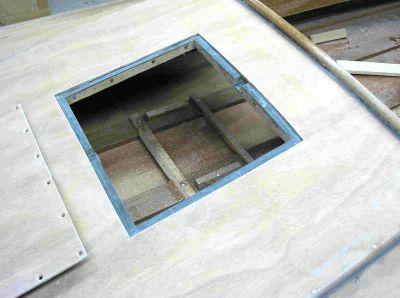 The boat was built to the plans with the exception of some extra reinforcing for a battery hatch in the front. 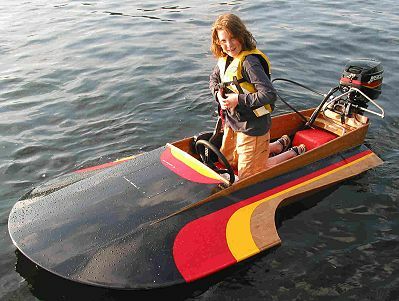 The boat is fully fiberglassed and rides great with a 15 HP Mercury, having a top speed just over 35 MPH. A 9.9 sticker is on the motor to make it "legal" for my son in Canada who won't turn 12 until after the summer. This is the first sea-flea to enjoy the waters of Kashagawigimog and Canning Lake in Haliburton Ontario for over 25 years and has been thoroughly enjoyed by all of our family and friends this summer.